Hanan Meltzer, a successful attorney who has handled the legal aspects of some of Israel's largest infrastructure projects, was sworn into the Supreme Court by President Shimon Peres on Monday. Metlzer was the first private sector attorney to be appointed to the Supreme Court in many years, and was sworn in during a ceremony for all the country’s new judges at the president’s residence in Jerusalem, along with other new Supreme Court judges. “This is a calling, because I believe that any man given the opportunity to do something for the country should do his very best,” Meltzer told Ynet on the eve of his appointment. 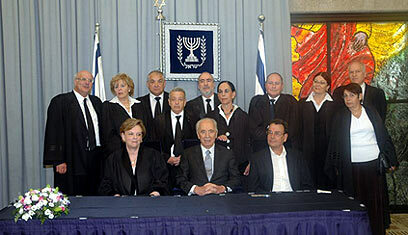 “This passing year was not an easy one for the legal system,” Supreme Court President Dorit Beinish said during the swearing-in ceremony. Beinish congratulated the new judges who she said would “contribute to the courts working faster and becoming more accessible”. The Supreme Court president also mentioned that Justice Minister Daniel Friedmann, with whom she has been at odds until a recent truce, took part in the task of selecting the Supreme Court appointments. During her speech, Beinish warned against attempts to undermine the authority of the High Court of Justice, saying that such attempts were a “direct blow to the democratic nature of the State of Israel”. She also expressed hope that the pace at which hearings took place would speed up during the coming year. “With regards to the system’s administrative aspects, we have reason to hope that during the next legal year we will be able to rectify some of the issues on the agenda,” she added. The justice minister also spoke at the ceremony, and said he hoped something could be done in order to lift some of the “heavy load weighing down on the Supreme Court”. “Procedural actions that have been taken will continue to be taken. Our legal system is under a lot of pressure, coming from a row of sources. Procedures must be optimized, and I hope we will achieve that through cooperation,” Friedman said. During his speech at the swearing-in ceremony, Peres emphasized that “legislatures were not judges, judges were not executors, and ministers were not legislatures or judges”. “The test lies not only in maintaining a clear separation between the three authorities, but also in preventing friction between them,” Peres said. See all talkbacks "New Supreme Court judge sworn in"